In the B2B marketplace, you know how competitive it can be to capture the attention of your prospects, generate high-quality leads, nurture the relationships, accelerate the often lengthy sales cycle, and improve customer retention. Video has become the most popular type of mobile content and it can help deliver your content in a succinct and engaging manner. Zendesk, a popular customer service platform, realized that many users are searching for "Zendesk alternatives" online so they created this one-page site to "hijack" the keyword phrase with an entertaining video to deliver an on-brand experience that builds goodwill. Stay current on trending conversations and customer behaviors to identify a topic into which you can inject your brand personality and create an engaging storyline. This explainer video from Liquid Planner shows how the software works, communicates its benefits, and highlights its unique predictive planning technology. Demo or explainer videos should showcase aspects of your products that are most relevant to your target audience. Refer to your buyer personas' challenges and pain points to inform the focus of your content. Blog posts are great for sharing complex and in-depth information that's often appealing to a B2B audience. The text-based content also helps with search engine optimization. In-depth articles, such as this blog post from Toyota Equipment, can help build trust with a B2B audience that's looking for relevant and useful information to help them gain new knowledge and do their jobs better. Identify potential topics by doing keyword research to see what your ideal audience is searching and what's trending in your industry. Publishing content on new processes and concepts is particularly great for gaining a thought leader positioning. 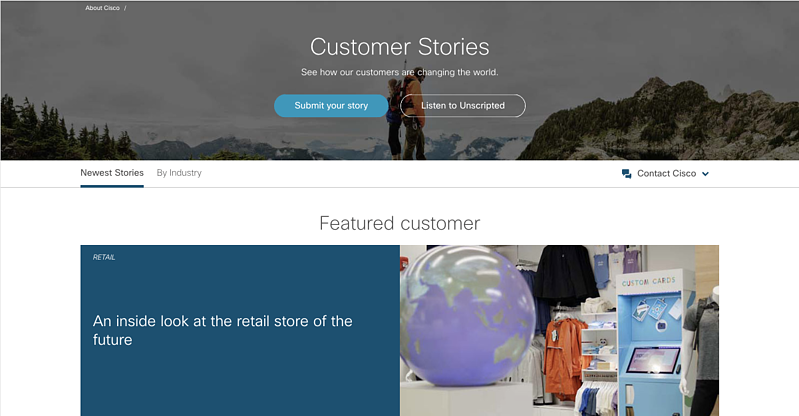 Cisco tells customer success stories to entice businesses to sign up for their products and services and inspire users to expand their usage. It's a great form of bottom-of-the-funnel content that helps improve conversion and retention. Identify customers that are getting results from your products or services. Feature users your audience can identify with and include concrete metrics to illustrate the results they're achieving. These are ideal formats for lead generation and positioning your brand as a subject matter expert to build trust with prospects. This ebook from LinkedIn provides practical how-to information gathered from its internal marketing team. The first-hand examples and from-the-trenches tips are attractive to its target audience. Leverage the knowledge of your internal team or interview industry leaders to compile unique insights and translate them into practical strategies your readers can apply to get results. B2B audiences are always looking for the latest strategies and statistics to help them stay current and relevant. This ebook from Hubspot combines the latest statistics with a practical checklist to help readers put the information into action. Some B2B brands have achieved great results by conducting their own surveys, publishing an annual "state of the industry" report with current statistics, and adding a how-to component (e.g., checklist) to make the information more relevant. "Ultimate guides," such as this 8-chapter eBook, generate leads by offering a large amount of practical information in an organized format and is a great way to capture top-of-the-funnel traffic. If you have been doing content marketing for a while (e.g., publishing on your blog, posting on social media), you have probably accumulated a good amount of content on a variety of topics that are relevant to your audience. You can take inventory of your assets and leverage the content as the foundation of your ultimate guide. There are many content formats that are great for attracting B2B audiences. Used as part of your growth marketing strategy, you can generate high-quality leads and build customer relationships. When selecting content types, remember to consider your specific audience's preferences and the nature of the content so you can deliver the information in the most impactful medium.